Tushingham was born in Liverpool, Lancashire where her father was a grocer who ran three shops and she grew up in the Hunt's Cross area. She attended the Heatherlea school in Allerton, the La Sagesse convent school in Grassendale (became part of St Julie's Catholic High School) and then studied shorthand and typing at secretarial school. She wanted to be an actress from an early age and trained at the Shelagh Elliott-Clarke school before working backstage as an assistant stage manager at the Liverpool Playhouse. Her screen debut was in A Taste of Honey (1961). Other performances included Girl with Green Eyes (1964), The Leather Boys (1964),The Knack …and How to Get It (1965), Doctor Zhivago (1965), The Trap (1966), Smashing Time (1967), The Bed Sitting Room (1969), and The 'Human' Factor starring George Kennedy and John Mills (1975). She also co-starred as Margaret Sheen in the TV film Green Eyes (1977). In the 1960s Tushingham performed several plays for the English Stage Company at the Royal Court Theatre: The Changeling (1961), The Kitchen (1961), A Midsummer Night's Dream (1962), Twelfth Night (production without décor, 1962) and The Knack (1962). Tushingham has won a Golden Globe and a BAFTA Award, and was a member of the jury at the 22nd Berlin International Film Festival in 1972 and at the 40th Berlin International Film Festival in 1990. Later roles include the film Being Julia (2004), starring Annette Bening, and on television in "The Sittaford Mystery" (2006), an episode of Marple. She appeared in Season 2 of the BBC 3 zombie drama In The Flesh as Mrs Lamb, broadcast in May 2014. Clips from her performance in The Leather Boys appeared in the Smiths' music video for the single "Girlfriend in a Coma," in 1987. She is also mentioned in the Franz Ferdinand song "L. Wells", the Cleaners From Venus song "Illya Kuryakin Looked at Me" and the Television Personalities song "Favourite Films". In 1999, she was featured on This Is Your Life. Tushingham married photographer Terry Bicknell in 1962. They had two daughters, Dodonna and Aisha Bicknell. In 1981, she married Iraqi cinematographer Ousama Rawi, spending eight years in Canada with him. She now divides her time between Germany and London, with her partner since the mid-1990s, writer Hans-Heinrich Ziemann. In April 2005, at the age of 33, her daughter Aisha Bicknell was diagnosed with breast cancer. She recovered and later gave birth to a son. Tushingham subsequently became an activist for breast cancer health and support. Tushingham and Bicknell are prominent supporters of Cancer Research UK's Relay for Life and have given a number of interviews to raise breast cancer awareness. 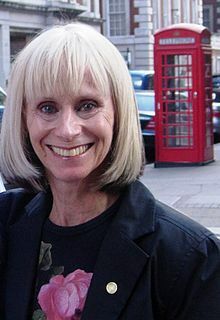 In July 2009, Tushingham received an Honorary Fellowship from Liverpool John Moores University for "outstanding and sustained contributions to the Performing Arts". 1961 A Taste of Honey Josephine "Jo"
1965 Doctor Zhivago Tanya Komarova / "The Girl"
1964 The Human Jungle Joy South "The Man Who Fell Apart"
1973 Armchair Theatre Grace "Red Riding Hood"
1980 Ladykillers Charlotte Bryant "Don't Let Them Kill Me on Wednesday"
1984 Seeing Things Dr. Jessica Edwards "Seeing R.E.D." 1985 ABC Weekend Special Mrs. Prysselius "Pippi Longstocking"
2002 Helen West Margaret Mellors "Shadow Play"
2005 New Tricks Elise "Creative Problem Solving"
2006 Agatha Christie's Marple Miss Elizabeth Percehouse "The Sittaford Mystery"
2014 In the Flesh Mrs. Lamb "2.4", "2.5", "2.6"
2016 Neil Gaiman's Likely Stories Effie Corvier "Feeders and Eaters"
2018 Vera Audrey Latham "Home"
Tushingham was made Honorary Associate of London Film School. ^ "Rita Tushingham at screenonline". screenonline.org. Retrieved 23 August 2014. ^ "Rita Tushingham 1942". ritatushingham.com. Retrieved 23 August 2014. ^ "Berlinale: 1990 Juries". berlinale.de. Retrieved 14 March 2011. ^ Lambert, Victoria (21 August 2006). "The knack of coping with cancer". The Daily Telegraph. London. Retrieved 22 May 2010. ^ "Cancer Research UK: Celebrities supporting Cancer Research UK". ^ "Rita Tushingham - Oration presented by Professor Frank Sanderson". Liverpool John Moores University. 2009. Retrieved 16 September 2018. And we are delighted to honour her today for her outstanding and sustained contributions to the performing arts. ^ David Barnett (12 February 2016). "Neil Gaiman's Likely Stories brings tales of 'psychological cannibalism' to TV". The Guardian. Retrieved 27 November 2016. ^ "Vera - S8 - Episode 3: Home". Radio Times.